Fibromyalgia is a name for widespread pain affecting the muscles but not the joints. It will not cause permanent damage to tissues but the symptoms may last for months or years. There are no outward signs of the condition and people with fibromyalgia often look well but feel awful. Because of this, other people may not appreciate the pain and tiredness you are suffering and this can cause additional distress. Fibromyalgia is a common condition and is sometimes so severe that it affects your work and your personal and social life. In fibromyalgia the tendons and ligaments, or fibrous tissues (fibro-), and the muscles (-my-) are affected by pain (-algia) and tenderness. The pain may feel as though it affects the whole body. There are usually tender points in certain areas of the body. These help the doctor to make the diagnosis. If enough pressure is applied to these places most people will find it uncomfortable, but in fibromyalgia there is a change in the threshold at which pressure causes pain and many of these points can be extremely tender. 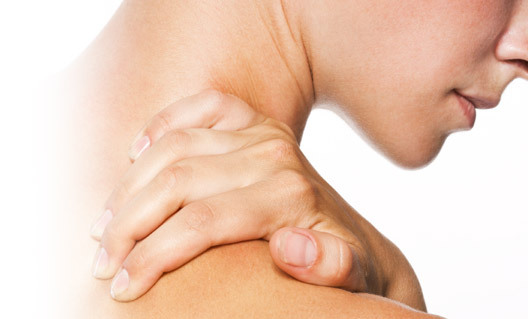 Tenderness at individual sites sometimes occurs and this can give rise to localised conditions such as tennis elbow. In fibromyalgia, however, there is tenderness at a number of points. In the past fibromyalgia was often diagnosed as muscular rheumatism or fibrositis, or it was misdiagnosed as degenerative disease of the joints (signs of wear and tear are very common on spine x-rays as we get older, whether there is pain or not). Research in the past few years has led to a clearer picture of what we mean by fibromyalgia, and the diagnosis is being made more often by rheumatologists and general practitioners (GPs). Pain, tiredness and sleep disturbance are the main symptoms of fibromyalgia. Most people feel the pain of fibromyalgia as aching, stiffness and tiredness in the muscles around the joints. It may feel worse first thing in the morning, or as the day goes on, or with activity. It may affect one part of the body or several different areas such as the limbs, neck and back. Sometimes tiredness (fatigue) can be the most severe aspect of fibromyalgia. There may be overall tiredness and lack of energy, or muscular fatigue and loss of stamina. Either way, it can be difficult to climb the stairs, do the household chores, go shopping or go to work. Becoming less fit makes matters worse. Waking in the morning feeling unrefreshed is common. irritable bowels (diarrhoea and abdominal pain). Of course symptoms like these can have other causes, and your doctor can help decide whether any further tests or advice are needed. The severity of the symptoms and the effects of fibromyalgia can vary considerably, and this range of severity can cause problems in diagnosing the condition and lead to varying medical opinions. A particular feature of fibromyalgia is the need to have the symptoms recognised and to be taken seriously. Is fibromyalgia similar to chronic or postviral fatigue (ME)? The symptoms described in myalgic encephalomyelitis (ME) are often very similar to those in fibromyalgia except that ME sufferers can often recall a viral infection before symptoms appeared, and may have less pain. Many doctors use the term ‘chronic fatigue syndrome’ rather than ME. More needs to be known about these conditions before we are able to say whether they are the same thing. There is now a clearer understanding that illness is not easily divided into physical or mental, and that there is an interaction between them. Fibromyalgia is an illness involving both the mind and the body. Sometimes this is called a functional disturbance. Research into fibromyalgia has been stimulated by the finding of specific tender points and the discovery of sleep disturbance. Brain wave studies (electro-encephalography, or EEG) during sleep have revealed that people with fibromyalgia lose deep sleep. Deep (non-dreaming), ‘restorative’ sleep is repeatedly and excessively disturbed by lighter, dreaming (rapid eye movement, or REM) sleep. In an experiment, some healthy people who were woken up in each period of deep sleep suffered the typical symptoms and tender points of fibromyalgia. Several things could cause the disturbance of deep sleep that can produce fibromyalgia. More than one cause may be affecting any particular individual. Pain or stiffness in the neck may disturb sleep. 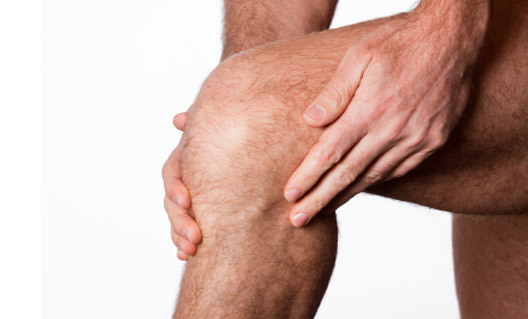 There may be the pain and stress of an injury or of another disease like arthritis. Emotional pain and the strain of anxiety or depression brought on by events or relationships at home or at work may also be important factors, as may abuse in childhood. 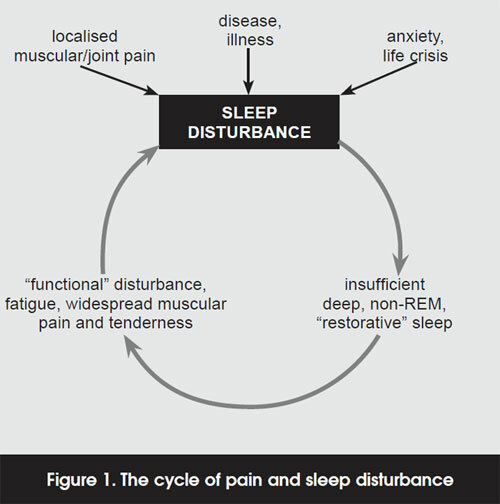 Once fibromyalgia sets in there is a vicious cycle producing pain and more sleep disturbance. This can be enough to cause depression even if this was not a problem initially. When fibromyalgia is obviously associated with another condition like arthritis or depression it is called ‘secondary’ (i.e. caused by the other condition). When it seems to be occurring alone it is called ‘primary’. Research is being carried out to find out whether chemical changes in the nervous system might cause increased sensitivity (known as sensitisation) to pressure or relatively minor knocks which would not normally be painful. Fibromyalgia may settle down by itself, but this can take weeks, months or even years. Your doctor may be able to help you by making the diagnosis of fibromyalgia and reassuring you that despite all the pain you don’t have a condition that will cause permanent disability. You are no more likely to develop arthritis later on than anyone else. Your family can also help with understanding and encouragement. Your doctor can prescribe a variety of medications which may help with the pain. These include painkillers such as paracetamol and non-steroidal anti-inflammatory drugs (NSAIDs) (of which there are many). A steroid injection in the affected area may give temporary relief if one or two places are particularly painful. Your doctor can also try to help with the sleep disturbance. Sleeping in a soft collar can help some people sleep better, particularly if the neck is uncomfortable. There is no harm in you trying this for a week or so, providing you do not get into the habit of wearing it during the day. Ordinary sleeping tablets are best avoided because they are often habit-forming and eventually lose their effect. Many people with fibromyalgia can also be helped by an antidepressant drug. Some of the older antidepressants (e.g. amitriptyline) have been found to be effective for long-term (chronic) pain. They may also have a sedative effect and help to restore a sleep pattern. This can be helpful even if you do not have the depression which is often associated with fibromyalgia. The benefit may not be immediate, and you may notice side-effects – usually drowsiness during the day – before the benefits, so it is worth trying for at least a couple of months before deciding if they are helpful. Your doctor will gradually raise the dose to an effective level. Your doctor may also refer you to a physiotherapist, an occupational therapist or a counsellor for further information and advice about fibromyalgia. However, the most effective therapist will be you, yourself. How can I treat my own fibromyalgia? It is worth facing up to the fact that fibromyalgia can be severe, and may last for several years. The good news is that many people have learnt to control their condition so that they can continue to live their lives enjoyably. People with fibromyalgia tell us that the following advice does work and will help if you persevere. Learn more about fibromyalgia (from this article and from other sources) and find out if there is a local support group in your area. Sharing the frustration of having this condition and knowing that other people out there have similar problems can help enormously. Ask your family to read this article and, if you want to, encourage them to discuss your condition with you. Your illness will be affecting their lives as well and they will need to know how and when to help you. Try the medication your doctor has to offer and then decide if you want to continue taking it. Don’t drink alcohol, tea or coffee late at night, as these may disturb your sleep. Relaxation and gentle exercise can help you sleep. Learn to take time out for yourself. Reduce muscle tension and stress. Learn to relax your mind and your muscles. Playing music or an audio tape about relaxation techniques can also help. Find more effective ways of communicating feelings such as anger. Counselling or cognitive behavioural therapy may help and your GP may be able to refer you. Try to sort out any unhappiness or difficulties at home or at work. Eat healthily and keep your weight down. Research has shown that aerobic exercise improves fitness and reduces pain and fatigue in people with fibromyalgia. This needn’t mean joining an ‘aerobics’ class (unless you want to). Aerobic exercise means increasing the circulation of oxygen through the blood, so any brisk exercise which gets you breathing heavily and your heart beating faster can be aerobic. Swimming is one of the best forms of exercise for fibromyalgia. Many people who have not learned to swim find the effort to do so is well worthwhile. Try different activities to find out what helps you and gradually try to do more each day, pacing yourself and gradually increasing your physical activity. You must be prepared for setbacks, and for the fact that activity may cause pain initially. Remember too that what helps one person with fibromyalgia may not work so well for another. Don’t be overambitious about your progress. Slow and steady is better. If you feel that walking down the road is more than you can manage, start by counting the houses you pass each day and after some time you will find you’re counting the streets. If you go swimming (and warmer water is more soothing), start just by standing and moving your arms and legs against the resistance of the water, then go on to lengths, and eventually you could be doing the sort of exercise you used to do. You must expect exercise to be painful initially and you may also feel tired. Build up your exercise at a rate you can cope with. Start gently and build up to at least 3 hours of exercise each week. It is often better to do 10 minutes and have a break than to do an hour all in one go. If pain and tiredness increase a lot, then don’t do quite so much the next day. Exercising progressively will improve your fitness, flexibility and stamina. Gradually your muscles will become stronger and there will be more muscle fibres to move your limbs smoothly and avoid jarring of tendons and ligaments. Exercise also promotes sleep and improves your sense of well-being. No particular diet has been shown to help fibromyalgia, but it is sensible to lose excess weight and to avoid drinking too much coffee and tea. Controlling your diet helps you feel in control of your body. Treatments like massage, acupuncture, physiotherapy, and manipulation from a chiropractor or osteopath can all soothe pain and improve morale, but the benefits may not be long-lasting. Only you can decide whether the benefits are worth the time and expense. Exercise, sound sleep and dealing with physical or mental stress are the keys to reducing the pain and fatigue of fibromyalgia. Going to work can help. Until research provides us with better answers you should aim for self-reliance.